Best﻿﻿ attenuator﻿﻿﻿ I have ever used....but I sold the three amps I used with it the most. This is the original run in Dodger Blue...the owner of Badcat John Thompson is a HUGE Angels fan and made the initial order in Angels red...his second in command thought it would be funny to change it to Dodger Blue, since they are the antithesis of the Angels....Anyway, I sent it in in 2018 ﻿have the front board updated to V2 specs...thus these are called V 1.5 by users and Badcat themselves. 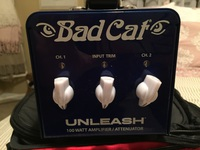 ﻿ Excellent condition, ne﻿ver gigged, smoke-free home, yada, yada...excellent attenuator, reamp, FX loop, direct out, has two footswitchable channels so one can be set as a boost (that is very cool), light, and does a great job either bringing loud amps down or small amps up. 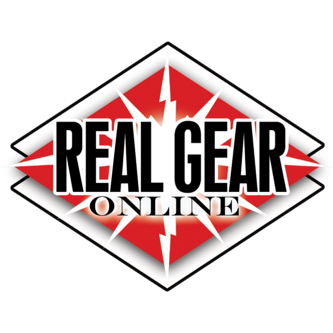 So your Champ is now giggable and your 50 watt Plexi can now be played in a bedroom. The loop is cool and you can run pedals through it alone without an amp. What I mean is, you can run say, a Tech 21 Liverpool through the loop and out to a speaker can letting the Unleash provide the﻿ power. 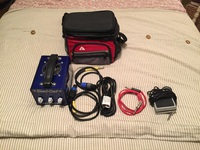 Includes 2 speakon to 1/4 cables (sh﻿ips with one, I am adding another from Badcat), power cable, speaker cable (from amp to Unleash), Hosa footswitch, And a cool little lunchbox I bought that fits PERFECTLY as a carry bag for the Unleas﻿h. Also the manual. - it is an fx loop box ? 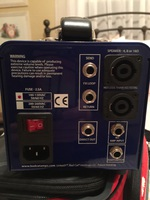 KC, all correct, plus it has a direct out for recording or PA, as well as 2 channels so one can be set as a boost.